Newington, N.H. (November 5, 2018) – SIG AIR adds to its world-class Advanced Sport Pellet (ASP) line of airguns with the introduction of the new M17 CO2-powered air pistol. This semi-automatic .177 caliber pellet pistol is a replica of the U.S. Army issued P320 M17 and is field strippable like its centerfire counterpart. It has the same look and feel as the M17 featuring a polymer frame and metal slide with realistic blow-back action. The proprietary drop magazine houses a 20-round Rapid Pellet Magazine (RPM) and 12g CO2 cartridge which has a patented cam lever loading port for quick and easy replacement of the CO2 cartridge. 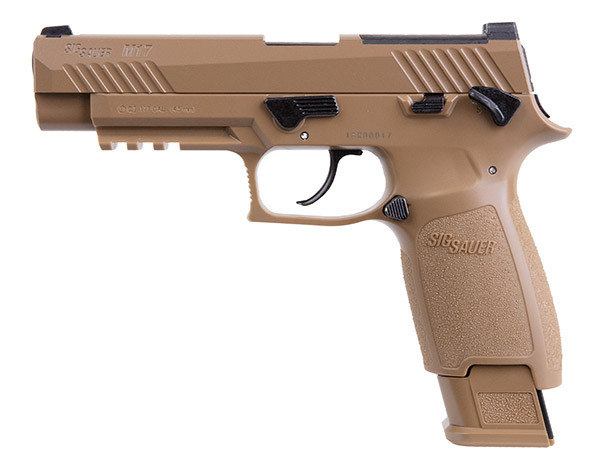 SIG AIR adds to its world-class Advanced Sport Pellet (ASP) line of airguns with the introduction of the new M17 CO2-powered air pistol. This semi-automatic .177 caliber pellet pistol is a replica of the U.S. Army issued P320 M17 and is field strippable like its centerfire counterpart. It has the same look and feel as the M17 featuring a polymer frame and metal slide with realistic blow-back action. The proprietary drop magazine houses a 20-round Rapid Pellet Magazine (RPM) and 12g CO2 cartridge which has a patented cam lever loading port for quick and easy replacement of the CO2 cartridge. The M17 ASP pistol weighs 2.15 lbs. The sights are fixed with a white dot front sight and the accessory rail allows easy mounting of a laser or tactical flashlight. Velocity is up to 430 fps; however, velocity results may vary depending on pellet weight, temperature and altitude. Available in Coyote Tan. To purchase and learn more about the M17 Air Pistol, visit sigsauer.com. This entry was posted in Airsoft and tagged air pistol, ASP, M17, SIG SAUER. Bookmark the permalink.